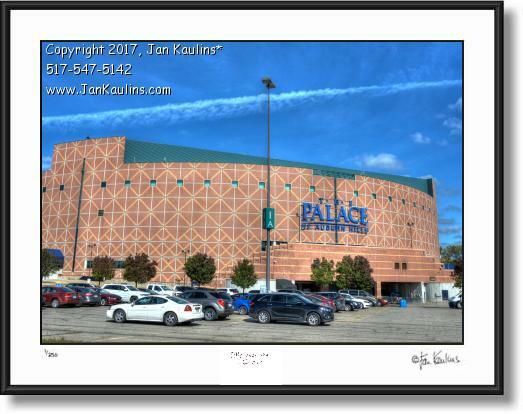 PALACE AT AUBURN HILLS photo picture art print for sale. This PALACE AT AUBURN HILLS photo art print for sale is from multiple bracketed photographic exposures, giving it the richness and texture not seen in single image photos. THE PALACE AT AUBURN HILLS opened with a concert by Sting in 1988, but always was the primary home of THE DETROIT PISTONS. It got the nations attention with THE DETROIT BAD BOYS who won back to back NBA Championships during 1988-89 and 1989-90 seasons. The 29 year history of THE PALACE came to an end when it was announced that The Detroit Pistons were moving to downtown Detroit to share the Little Ceasers Arena with The Detroit Red Wings. This now historic photo was taken shortly after that news came out celebrating the 29 year history and memories of THE PALACE.